With an air of rich traditional style, the poster bed is graceful with its clean, simple lines, solid square posts with moulding, and arched fretwork gracing the outer curve of the headboard. This poster bed is sure to create a dramatic and focal presence in any bedroom decor. This bed is available in queen and king sizes. The Timberline Queen Poster Bed by Rooms Collection Three at Rooms Furniture in the Houston, Sugar Land, Katy, Missouri City, Texas area. Product availability may vary. Contact us for the most current availability on this product. 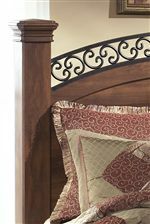 B258-77 Queen Poster Headboard Panel 1 54" 2" 37"
B258-71N Qn/Kg Poster Headboard Posts 1 8" 8" 61"
Case Detail Simplistic moulding, decorative fretwork and curved aprons create a harmonious look and feel. Drawer / Shelf Construction Numerous drawers and shelves provide ample storage options as well as durability for extended usage. 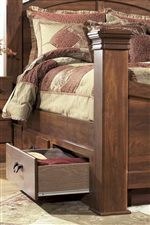 The Timberline collection is a great option if you are looking for Cottage furniture in the Houston, Sugar Land, Katy, Missouri City, Texas area. 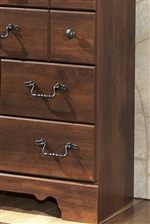 Browse other items in the Timberline collection from Rooms Furniture in the Houston, Sugar Land, Katy, Missouri City, Texas area.